Domini Games presents the next exciting chapter of their classic Mystery Tales saga! Your good friend Officer Jefferson needs your help! Use your paranormal powers to track down his sister Maya and colleagues in an abandoned cinema before the ghostly director makes them the star of his latest film. 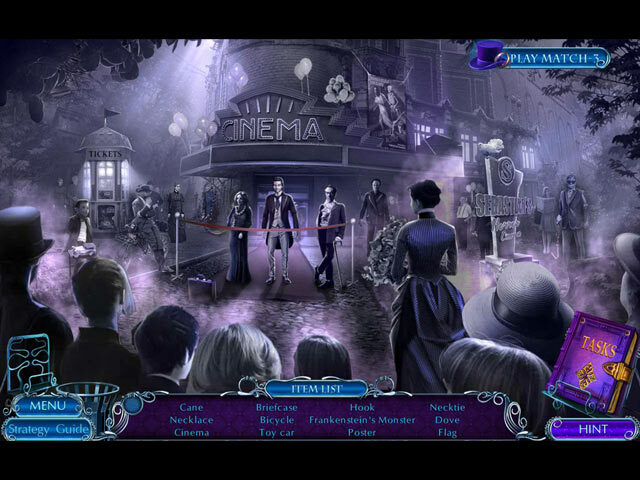 Hold onto the edge of your seat for this spooky hidden-object puzzle adventure game! 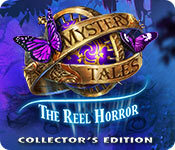 Mystery Tales: The Reel Horror Collector's Edition is rated 4.2 out of 5 by 31. Rated 5 out of 5 by nariiska from Another take on the paranormal This game is full of facts, updates on tools(smartphone) and overall easy to follow and the storyline grabs and draws you in. Rated 5 out of 5 by hoosierhasbeen from Nice LOOONG Game This game and the bonus Chapter were both very long. That's just the way I like them. I feel like I got my money's worth! Everyone gives recap, so I'll just say it was fun and kept me interested all the way through. A few of the puzzles weren't my thing, so I skipped. Other than that, great. Rated 5 out of 5 by puzzgamer1 from FINALLY a very good creepy, mysterious game. They're SO FEW! Very much enjoyed this game. I like the good creepy, eeire, mysterious games...WITH a good story line, good visuals, good sound, not so many puzzles that it is just a puzzle fest. This ticked all the boxes for me. There used to be more good creepy games, well done but sadly in past couple of years fewer and fewer..I want a good story and graphics and sound! Will replay another time..going to keep on my 'replay' list-.and that's saying something. Rated 5 out of 5 by LisaGamer1 from Really Enjoyed this game! Interesting story that is well told...it holds your interest. This is the first game in this series that I have played and I will try the others, although many of the others got mediocre reviews. The hidden objects were challenging without giving me a headache from trying to find them. Characters were well developed , and I got a kick out of the fact that the villainous director-ghost reminded me a bit of the late great horror actor Vincent Price and I could see him cast in that role perfectly. All in all I thoroughly recommend this game! Rated 5 out of 5 by englishb from Got lost in the game, Forgot that it was the demo!! I found it such an absorbing game that I forgot this was the demo. I think that this is my new favorite game, if the rest lives up to the demo. Deferent people like deferent games so I try not to tell people that they will like it. Its up to you but its defiantly one to play the demo part, so you can see if you like it has much as I did. Worth a try!! Rated 5 out of 5 by CameoLove from Fun Fun Fun This game has lots of chapters! All of the HO scenes were filled with lots of interaction and variety. The graphics were stunning and the story was entertaining. I enjoyed most of the mini games although even on easy I had to skip a couple. Each new scene you enter has several objects to click on that are not part of the adventure but do interesting things. I am really enjoying this one. Rated 5 out of 5 by angelicsinner33 from Must Buy!!! 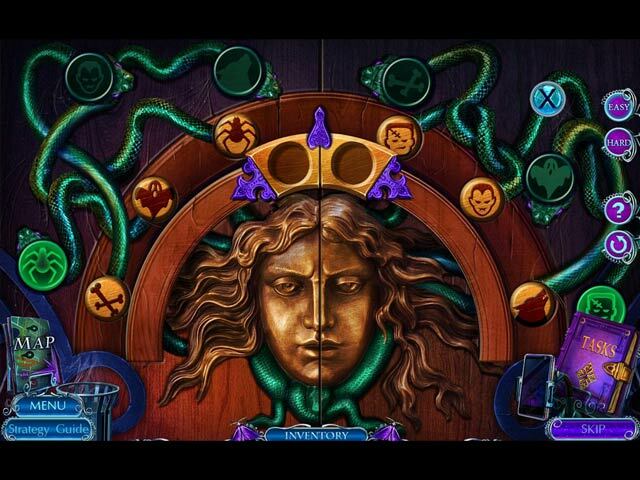 This game is definitely a must buy for any true horror/Hidden Object fan! The graphics are amazing, the story line is absolutely wonderful, the mini games are so much fun and the length of the game beats most of the other games I've played. Trust me, that's saying something. One of my favorites aspects is that the game gives you a choice for a substitute mini game in place of a Hidden Object scene. Definitely worth every penny spent. Rated 5 out of 5 by sbruck from LOVED IT VIVID GRAPHICS, TOUCH OF SCARE FACTOR, THE LENGTH OF THE GAME IS GREAT. Face the fears in Sebastian's Cinema of Horrors!